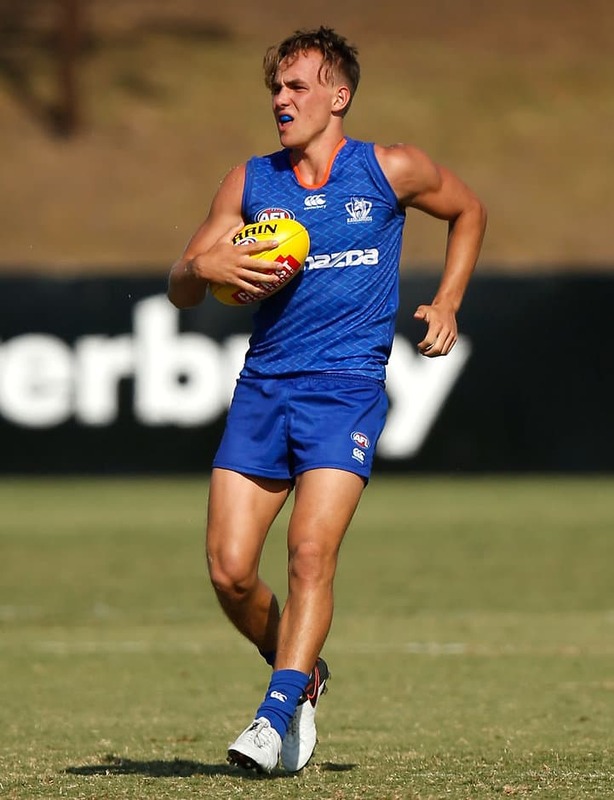 RYAN Clarke says it was "surreal" to play alongside North Melbourne stars Brent Harvey, Todd Goldstein and Daniel Wells in last Friday's intra-club game, but the first-year midfielder did not look out of place. On a warm day at Arden Street, Clarke won plenty of the ball as he showcased the gut-running that became his trademark with Eastern Ranges last season in the TAC Cup. Clarke's performance continued the impressive transition he's made to AFL life since North took him with its second pick in last year's NAB AFL Draft, at No.31 overall. The Roos have been so encouraged by what they've seen from Clarke this pre-season they have rewarded him with a one-year contract extension. Having signed a standard two-year deal upon being drafted, Clarke is now tied to Arden Street until the end of 2018. "I'm really stoked," Clarke told AFL.com.au on Monday. "It just shows that the club has faith in me, so hopefully a few of the other first-years [can re-sign] as well. I think we're all travelling pretty well." While fellow 2015 draftees Mitch Hibberd, Corey Wagner and Declan Mountford played for North's under-25 team last Friday, Clarke played with Harvey, Goldstein and Wells in the Roos' 'senior' team, one of several selection tweaks North made to even up the sides. The 18-year-old found the intra-club game a step up in intensity from North's practice match against VFL affiliate Werribee a week earlier, but "loved it". "It was really hot, really quick, so it was good to get out there and play with the likes of 'Wellsy' and Swallow in the midfield and 'Goldy' in the ruck," Clarke said. "You're playing alongside Wellsy, who kicks four in the first half, and you kind of just sit back and watch a bit. "You've been watching them on TV your whole life, so it's still pretty surreal to be playing with them now, but it's great." Clarke's impressive pre-season has him firmly in contention to play in North's opening NAB Challenge game against St Kilda on Saturday in Wangaratta. The midfielder hopes to play some part in North's three pre-season games, but notes other first-year Roos such as Hibberd, Wagner, Mountford and Ben McKay are all pressing for selection. As for his home and away season goals, Clarke wants to play as many senior games as possible but remains mindful of the bigger picture. "This year is more about me developing me as a player and just learning the midfield roles," he said. "If I get a game on top of that, that's just a bonus." Still, Clarke is keen to fast-track his development as much as possible. In an attempt to do so, he has tried to "soak up" the on-field nous of Ben Cunnington and Jack Ziebell. "'Cunners' is that big-bodied inside midfielder and then 'Ziebs' is someone who pushes forward, so I try to learn off them as much as possible," Clarke said. "And they've been awesome. When we're doing game sense (drills), at stoppages they will stop and help me out, so it's been good."